Today’s Accessory Thursday post is a little late and I feel guilty about that, but in my defense, let me explain. So, remember how I said I was moving? And I did move and I love my new place. However, the previous tenant had pets. And I discovered Monday that those pets left behind some… friends. Small jumping biting friends. I reported my unwanted roommates on Monday. They sprayed the unit yesterday and I spent most of yesterday evening either out or sitting on the back patio while the unit aired out. But seriously, I have never been more happy to smell the scent of pesticide in my life. Anyway, with all the laundry and other things I’ve been doing, there just wasn’t time to work on this blog post much. So, that’s why its a little late. Anyway, enough about my Adventures with Fleas! 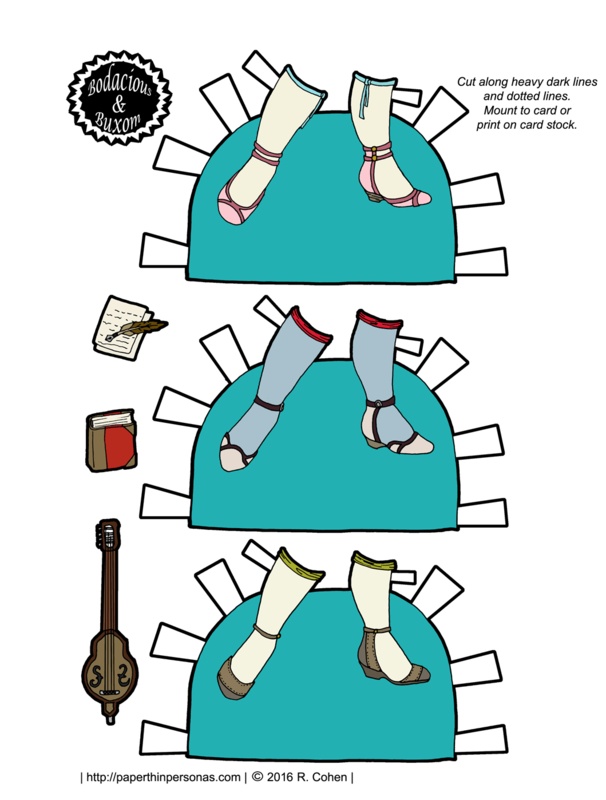 Let’s talk about paper dolls. Today, we have three pairs of shoes. Each one is colored to match one of the three dresses, including the paper doll dress that goes up on Friday. There’s also a book and a musical instrument and some papers. I struggle a little with scale sometimes with the B&B dolls, because they have such huge heads. Two usual pieces of housekeeping: The doll was posted Monday and the black and white versions are at the top of the post. Enjoy! You have such a way with shoes! I hate shoes — in my art and in real life — but yours are such an inspiration! Very cool theme this week.